incorporate artist books, handmade paper or printmaking and try to take an untraditional approach in housing or installing the work. I use historical photo processes, such as tin-type or cyanotype, as a way to add to or give a historical basis to the content of my work which is historical and contemporary women’s lives and feminism. Since my processes vary from project to project, it’s important to me that the method matches the project. I don’t want to create a body of work using salt prints for example, if that method of printing does not add to the content. I grew up in Portland, Maine, Southern Minnesota and the Twin Cities. I think a part of me has always felt I am from both New England and the Midwest, never quite fitting in to either but also being very much a part of both, if that makes sense. I get this same feeling within my mediums as well. I straddle photography, printmaking and the book arts (especially papermaking), feeling very rooted in all three but also not totally fitting into one medium. But in both cases, it’s you that connects all three and make it unique. My art has also been highly influenced by both my undergraduate and graduate school settings. As I mention later, my liberal arts undergraduate program at St. Olaf College influenced my work in its content, references and the way in which I approach my work. My MFA in Photography and Graduate Certificate in Book Arts from the University of Iowa have both influenced my work in terms of my mediums. I entered school doing traditional film photography and got interested in printmaking and book arts while at Iowa. I found myself spending most of my time in both departments, learning other ways to make or present photographic images that aren’t “traditional” photography. 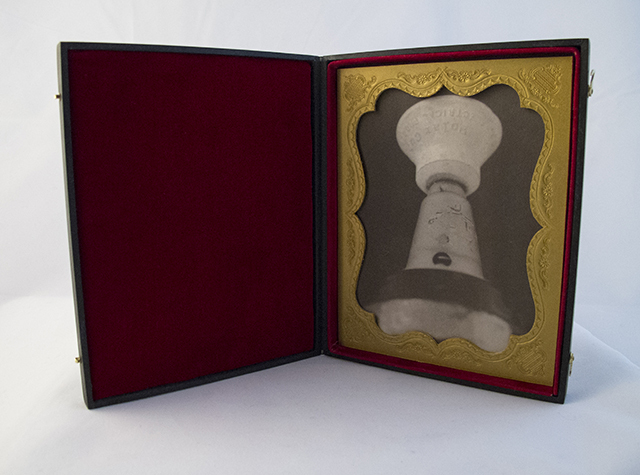 Although I always wanted to learn historical photography processes, my experiences in printmaking and book arts prepared me for alternative photography processes, as well as made me open to combining digital and analogue photography with artist books, handmade paper, sculpture and installation. You caught me at a unique time in my studio practice! I’m about to start setting up my own alternative processes darkroom a few months from now so my studio will soon change drastically. But for the last few years, I print and process film in the only community darkroom in Rhode Island. After graduating from grad school and moving to Providence, I joined AS220, an arts non-profit. There, I volunteer hours by maintaining and monitoring the darkroom and in return, use it to create my work. So my studio practice differs from a traditional darkroom in that I use a communal space and sign up for blocks of time to go print my work. Sometimes it can be challenging to not have your own space set up how you would want it, but a huge plus for me is that there are always people around and you avoid that loneliness of the stereotypical artist toiling away (in this case) in a dark room! In addition to the darkroom, I work in my apartment, either editing images, printing negatives, designing & binding artist books or finalizing my prints in various ways. For example, right now I am waxing prints, but I have also mounted them into union cases or shadowbox–it’s constantly changing, which makes it exciting for me. I have been compared to a librarian or a scientist in the way that I work—I guess it is pretty academic. I take a subject I am interested in; do a lot of research on it, let the information germinate and then share my “findings” through the work I create. I often convey the information through an accompanying artist book. For example, for my “Transmission” series, I was curious about various bacterial STDs that stemmed from an earlier project on STD-prevention methods. 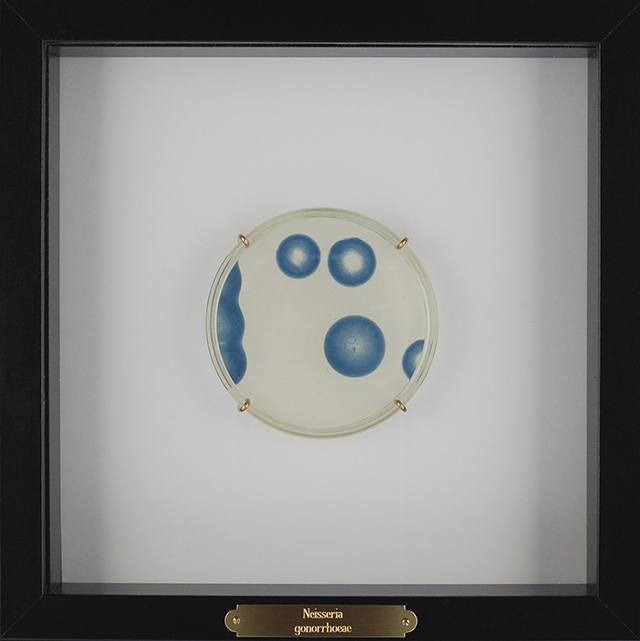 I researched the bacteria and created a body of work presenting the STDs to the viewers in an aesthetically pleasing yet menacing manner of embedding cyanotype prints of each bacterium in open Petri dishes. I created a handmade book in the style of old medical pamphlets to accompany the work that informed the viewer on each infection. I didn’t expect when I started out that my photography would end up being a way to educate myself and others about various topics. Since I’m not a photojournalist or a documentary photographer, I am surprised that this educational aspect has crept in but am happy with it. Right away in the morning. This can be a little impractical when I need to squeeze in making art any time I can make it. But if the day has progressed far enough, there are multiple distractions that can add up and make it really hard to focus in the studio. I’m pretty self-disciplined so I will work whenever and wherever I can! I am very strict about protecting my days off and keeping them as my studio days. These are the days that I get to printing in the darkroom right away and will spend all day there. When I work at home, I pretty much work any and all the time. When I work at home though, it can be hard to step away and take a break. I’ve definitely learned the pluses and minuses of having a studio at home and in a separate location these last few years! It has changed a lot in the last five years because in that time I went to graduate school and then post-graduate years! My constant has been my focus on feminist subject matter, using photographic means to explore these ideas and creating non-traditional ways in which to experience the images, often sculptural. It’s always been important to me to create a way in which to get the photographs off the wall or create photo objects or installations to view the work. So moving into historical and alternative photographic processes and incorporating the book arts made sense to me. I used to shoot portraits and nudes with 35mm black and white and medium-format color film in studio, either creating silver or digital prints. Your work changes a lot during school and mine might have been the most drastic among my classmates. I used found objects and subjects to create images through high-resolution scanners and large-scale prints to envelope the viewers’ sight. I then switched to using digital negatives and printing them with cyanotypes, an early form of the blue print that was used to catalogue collections. 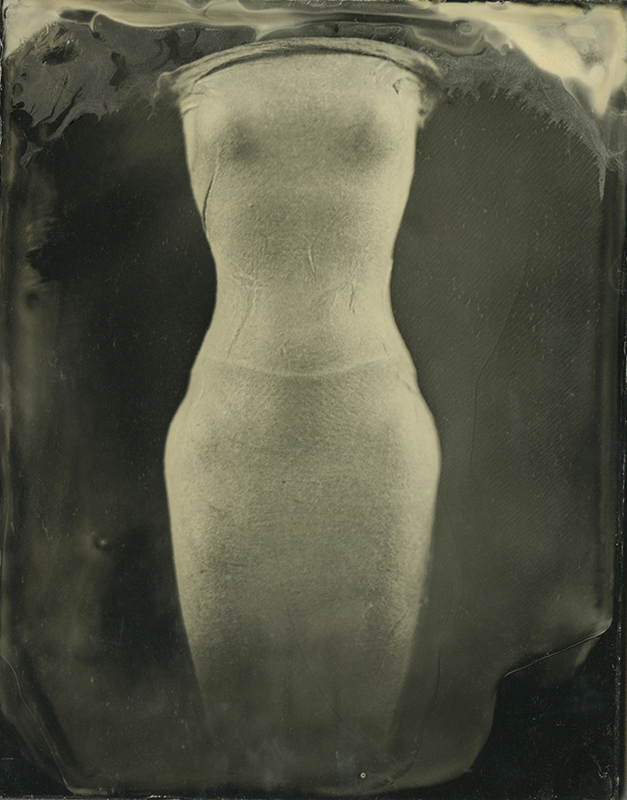 I returned to the camera and began to shoot actual collections, both my own handmade paper sculptures, and others’ with my 4”x5” camera using antique processes such as wet-plate collodion (think Civil War photography) and ziatype (a contemporary version of platinum printing). I am again using digital negatives with abstracted cell phone photos and printing them as cyanotypes. Regardless of how the images are captured, returning to the darkroom four years ago and getting to use my hands and chemistry again, has been a wonderful change that will remain in my work for the next five years! I think often partners of artists do not get acknowledged as much as they should—they have incredible influence on artists. My husband is a large influence—we met on the first day of college, so it would be hard to not have an influence on each other, let alone as I transitioned from art student to professional artist. He is not an artist but appreciates and understands art and is great for bouncing ideas off of. I saw my work change unconsciously as he began his education in medicine; my work explored sexuality through a medical lens, such as contraception or STD-prevention and my newest interests, historical OB/GYN and midwifery tools. Another influence is a wide range of authors and books. I read a lot—I was a voracious reader growing up and studied English in undergrad. I have and still work in a bookstore so what I read has a huge impact on my work. I know photo theory and love photo history, and as I mentioned, I read a lot when I research my projects, but the books and writers that have a huge impact on my work is often contemporary fiction and non-fiction. I have favorite books and authors, but it is often a small detail or occurrence that happens in a random book or article I happened to pick up that has more impact on my work. I’ve created a way to incorporate other areas of interests into my work. It stems from my liberal arts background. My first photography professor suggested I bring other areas of interest (or at the time my other majors or classes I was taking in undergrad). I obviously took that suggestion to heart because I still use it today! In my work, I get to become an amateur in everything. Any occupation I could possibly want to practice, I get to have a basic grounding in and than use that knowledge into my work. For example, I have studied archeology, art history, the classics, theology, medicine and sexual health, naturopathy—the list continues! Any occupation I would like to do outside of art, I am able to incorporate into my work, so I still get to fulfill that dream of becoming something else. Lindsey Beal is a photo-based artist in Providence, Rhode Island where she teaches at AS220 and Rhode Island College. She has an M.F.A. in Photography from the University of Iowa and a Certificate in Book Arts at the University of Iowa’s Center for the Book. 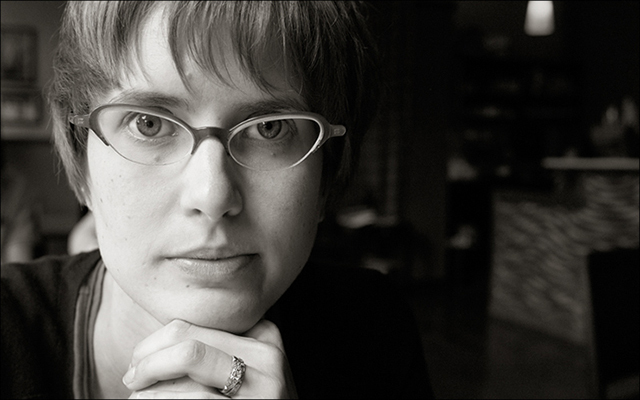 Her work focuses on historical and contemporary women’s lives and feminism. She combines traditional photography (analogue, digital and historical processes) with installation or sculpture to create non-traditional photographic work. This work often includes papermaking, printmaking and artist books. Her work has been shown at national universities and galleries and is included in various public and private collections. She recently received an Honorable Mention for emerging American photographers by the Magenta Foundation. She is represented by Boston’s Panopticon Gallery. Her work can be found at www.lindseybeal.net. This entry was posted in Uncategorized and tagged Alternative Processes, artist books, Handmade Paper, photography, printmaking. Bookmark the permalink.